Palmyra  is a village and surrounding town in the Finger Lakes region of New York. In the nineteenth century, it was a center for religious revivalism, but today it's one of the most-visited villages along the Erie Canal. Palmyra is the birthplace of the Mormon church and claims to be the only community in the U.S. that has a four-corner intersection with a church at each one. In the late 1780s, a group of settlers from Connecticut tried to stake the state's claim to land in northeastern Pennsylvania, due to overlapping provincial charters. Among those Connecticuters was one John Swift, a Revolutionary War veteran. In 1789, with the venture in Pennsylvania bearing little fruit, Swift decamped for Western New York, where the Phelps and Gorham Purchase had large tracts of land for sale. He purchased a tract (as did his fellow John Jenkins, though Swift soon bought him out) and in 1790 became the first permanent resident of what is now the Town of Palmyra. Swift's land was centered on Ganargua Creek, and the community that sprouted up was initially known as Swift's Landing. 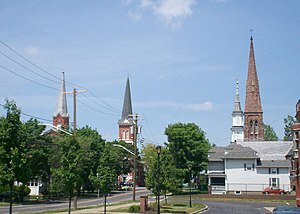 After a brief period known as Tolland, Swift's brother-in-law proposed the name Palmyra, and that is how the town was incorporated in 1796. The town center grew slowly until 1825, when the Erie Canal opened. The canal's route took it right through Palmyra, necessitating an aqueduct over Ganargua Creek. Energized by the new waterway, the village was quickly incorporated, in 1827. During the period in which the Canal was built, at the height of the Second Great Awakening, the area between Rochester and Syracuse became a hotbed for religious fervor, known as the Burned-Over District. Palmyra was a particularly prolific source of the newly devout. In the mid 1820s, a local young adult named Joseph Smith (whose family lived just over the county line in nearby Manchester) claimed to have been visited by an angel, and directed to a set of buried artifacts on Hill Cumorah. Among those artifacts, it is claimed, was a set of golden plates, which Smith alone could translate. His translation became the Book of Mormon, which was published for the first time in Palmyra in 1830. Despite that milestone, the area never embraced Smith's nascent religion (he had moved away in 1827 and never returned), and it wasn't until the year 2000 that the Church of Jesus Christ of Latter-day Saints built a temple here. But the founding is commemorated every year with the Hill Cumorah Pageant. Although RTS—Rochester's municipal bus system—does run a bus out to Palmyra twice daily on weekdays, it's timed for commuters, not tourists. You'll most likely be taking a car. As it does throughout Western New York, New York State Route 31 parallels the Erie Canal through Palmyra, making it your best option for arriving from the east or west. It enters from Lyons from the east and from Macedon from the west. From the north and south, New York State Route 21 will get you to Palmyra, connecting to Williamson and Marion northward and to Manchester and Canandaigua southward. If you're coming from farther afield, you'll want to take the east-west New York State Thruway (Interstate 90). Take Exit 43 and follow Route 21 north for about six miles. Once you're in town, free public parking is available in a number of lots along Route 31 (Main Street) and at the public parks. If you have a boat, you can take a scenic cruise into Palmyra along the historic Erie Canal, which runs right through town. Dock at the Port of Palmyra Marina, just east of the Division Street bridge. Palmyra's downtown area is quite walkable, and that's where you'll find most of the shops, eateries, and lodging. If you're exploring the canal, the Erie Canal Heritage Trail is great for walking or biking, though it's over a mile from the downtown/marina area to the far end of Aqueduct Park. If you want to head south to the Latter-day Saints sites, take your car or bike; they're three or four miles away, along a country road with no sidewalks. The word "charming" is perhaps overused in tourism brochures to describe exactly the sort of village that Palmyra is. If you're easily charmed by such sites, then Palmyra won't disappoint. In truth, though, there's not a lot here that you can't find in other similar canalside villages throughout the region. Still, Palmyra's claim to be the Queen of Erie Canal Towns is not entirely unfounded. You can easily spend a day here browsing the shops, strolling the canal, and taking in the sights and sounds. Traffic is relatively light, and there are few cookie-cutter retail chains spoiling the atmosphere. The church also maintains the Peter Whitmer Farm, 27 miles (43 km) east-southeast of Palmyra in Waterloo, and the Aaronic Priesthood Restoration Site in Oakland, Pennsylvania. Hill Cummorah Pageant - Each summer in mid July The Church of Jesus Christ of Latter-Day Saints puts on the Hill Cumorah Pageant, a big outdoor play about the origins of the church. Mormons from all over the country come to perform in it. It is free and worth experiencing if you happen to be in the area. You can usually expect some proselytizing inside the pageant from the church members and outside the pageant from the other Christian churches that want to keep you from going in. This page was last edited on 29 April 2015, at 19:54.